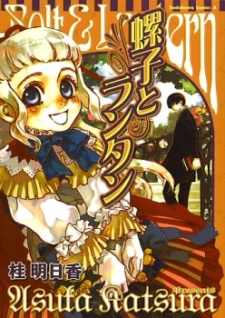 The very first manga by Asuka Katsura, who's worked on the Le Portrait de Petit Cossette manga and Blood+. Bolt and Lantern is an original oneshot set in 19th century england. Coco is a young girl who, due to the recent deaths of both her parents, has inherited the aristocratic title of "marquise" and the expectations that go along with it. A new tutor named Nidell is brought in to teach Coco all the languages that nobility are required to be fluent in, and quickly finds himself facing a past he's tried to hide and becoming more like a father-figure to Coco than a tutor. Bolt and Lantern's art is both cute and detailed at the same time, and is a must read for any fan of 19th century clothing! Or cute little girls and dashing young men. And a pretty, big-boobed maid later on, as well as an arrogant little boy. Fun ensues!